When a cow is called “pregnant” but turns up “open”- Could Neospora caninum be to Blame? “Neosporosis” is caused by a single celled protozoan parasite called Neospora caninum and is a major cause of abortion and weak calves in cattle across the US and worldwide. Neospora affects both beef and dairy cattle and abortions may present in clusters (epidemic outbreaks) or as sporadic cases. Due to the greatest risk of abortion occurring in mid to late gestation, cows diagnosed pregnant early in gestation may end up open at calving time. Infected cattle are 3-7 times more likely to abort compared to uninfected cattle. Neospora has been the most commonly detected and attributed cause of bovine abortion in US in recent years. Economic losses include stillbirth/neonatal mortality, early fetal death, increased calving interval, increased culling, reduced milk production and reduced value of breeding stock. The disease has proven to be challenging to control due to its complex lifecycle within the cow and the fact the Neospora caninum oocysts (eggs) may persist for long periods of time in an infectious form in the environment. Neospora was first identified in dogs, the “definitive” host of the parasite that can reduce Neospora oocysts (eggs) in their feces. If a dog eats Neospora– infected meat, then the parasite can invade and multiply within gut cells and oocysts will be excreted in the dog’s feces a few days later. Shedding is mostly seen in younger dogs, after their first exposure to the parasite. The oocysts can survive in the environment for many months and be a source of infection for many other host species including cattle. Neospora can infect by two main routes: 1) dog or coyote to cattle and 2) dam to calf during pregnancy. An important feature of this parasite is that once it gains entry, it is maintained as a life-long infection. 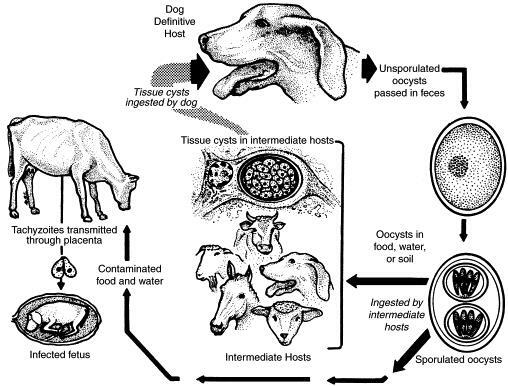 Dog (or coyote) to cattle transmission occurs when cattle ingest Neospora oocysts in contaminated feed, water or from pasture. As a result, many animals may become infected simultaneously. This can lead to abortion storms, where many cattle lose their fetus within a short period. Vertical transmission from dam to calf occurs when the parasite is dormant in the cow from a previous infection, but gets reactivated in the dam during pregnancy and attacks the fetus and placenta. In some pregnancies, this fetal infection may result in abortion or weak calves. However some calves born from positive dams are absolutely normal but carry the organism for life. Infected heifers can transmit Neospora to their offspring in subsequent pregnancies. This transmission route is very effective and Neospora may be maintained within a herd for many generations. The outcome of new infection or reactivation of infection in a cow depends on her stage of pregnancy. Infection/reactivation in the first trimester of gestation may result in early embryonic death. Infection/reactivation in the middle trimester can result in abortion or the birth of a weak or brain-damaged live calf. Infection in the last trimester will result in a weak or brain-damaged calf or a normal calf. An infected calf may be born alive with neurologic signs, birth defects, and /or born weak and unable to stand. It is important to realize apparently healthy calves can also be born to infected dams. These calves are congenitally infected and will blood test positive for N. caninum antibodies. Tissue cysts are typically in the brain and muscle tissue of cattle and other intermediate hosts. Illustration from Dubey JP: Neosporosis in cattle. Vet Clin North Am Food Anim Pract 21:473-483, 2005. Neosporosis is an important infectious disease of cattle worldwide that results in abortion and stillbirth. A majority of abortions occur from 4-6 months gestation (range from 3 months to 8 months) and the fetus is slightly rotten when expelled. The fetus that dies in utero may also be resorbed, mummified or stillborn. Neosporaeggs (oocysts) are shed by infected dogs and coyotes in their feces and are a source of infection for cattle. Additional hosts of caninum also include other wild canids such as foxes, with evidence of infection in raccoons and deer, such that wildlife may be a potential reservoir of infection. Infection in cattle is common and may be frequently spread from mother to calf during pregnancy and is often passed unnoticed over several generations. Many calves born to positive dams will be born persistently infected but normal. Disease occurs when Neosporainvades and multiplies within the placenta and fetus causing fetal death. Cows that have aborted once due to Neosporaare less likely to abort again, although the likelihood of vertically transmitting the organism from dam to calf is very high, resulting in persistence within a herd by propagating the infection to successive generations. Examination of the fetus is necessary for a definitive diagnosis of abortion due to neosporosis. The best tissues to sample include brain, heart, liver, placenta, and also body fluids. Fetal brain is the most consistently affected organ and has the most characteristic lesion. A positive blood test from an aborting cow only shows she has been exposed to N. caninum and is not necessarily the reason for her abortion. Several commercial blood tests are available that can detect antibody to N. caninum that are rapid, inexpensive and consistent. Control of Neospora is difficult. Knowledge of transmission routes and how the disease develops help form biosecurity and on-farm management strategies. N. caninum is efficiently transmitted vertically in cattle for several generations so culling of positive animals is one way to prevent the spread of infection. In herds with a high prevalence of infection, blood testing the herd and selling the offspring of positive cows is more economically feasible to reduce vertical transmission. Embryo transfer from positive cows to negative recipients can preserve valuable genetics safely. Testing of all purchased animals should be considered to prevent entry of positive animals in to the herd. To prevent horizontal transmission, it is important to prevent exposure of the cows to feed and water contaminated with feces from dogs or coyotes and potentially wild animals which may contain oocysts. Dogs and coyotes should not be allowed to eat aborted fetuses, fetal membranes, or dead cattle. Neospora caninum is a protozoan that is becoming more widely recognized as an infectious cause of reproductive problems in cattle. Blood testing for this organism should be considered especially in herds that vaccinate routinely for infectious causes of abortion yet are still experiencing losses, particularly in the second trimester of pregnancy. Definitive diagnosis of abortion is through detection of the N. caninum organism in the fetal tissues, usually the fetal brain. No known drug is available to clear a cow of infection. Control is based on culling positive animals, preventing entry of infected replacements into the herd, and preventing likely routes of horizontal infection. Posted by Smith at 8:10am May 3, 2016 Posted in Health. Bookmark the permalink.